Call me crazy but I am really concidering building a tiny house. Now I am a family with 3 children so it wouldn't be as extream as the ones that are only just over 100sq ft on a pull behind trailer. Now that I would be crazy to live in LOL. In general speaking as far as my life style goes I am a minimalist. I do not require much and nothing has to be fancy. Not to say I do not look at those georgous homes and drool a little, but I am still happy with out it. I encourouge my children to play outdoors as much as possible, growing up that was my option. I think getting a home back to the basics is really the best thing I could do for my family. I grew up in an old farm house and we did not even have running water or electric for many years. We lived with candles and an outhouse. We pumped our water from the well and cooked on the old black wood stoves. We had a huge garden and my dad hunted our meat. We had to buy very little from the store, which ment we rarely went into town. Now my idea of what would be good for my family would be something around 500-800sq ft. That would give us plenty of room and the added privacy for bedrooms as the kids aged, since I have one boy and two girls. The smaller the home means the less the untility bills would be as well. We have already paid for land, so we would have well water. I would put in a wood stove for heat since it would be efficent enough for a small space, as well as free as there are trees all over (just replant each year). The area I live in generaly has mild winters as well as mild summers, so if we had to a window a/c unit would be sufficent for cooling. Or windows with a box fan in it ;). Only requirement is I MUST have a full size kitchen. I love to cook and trying to live "off the grid" it is a must to be able to prepare foods you grow as well as being able to preserve them for later. That point brings me to the next task, I would love a HUGE garden. I have always been able to garden until this last home I moved into. I hate renting for that reason alone! Being able to grow fresh food and freeze/can them so you have them for all year is just a dream. Once again this is how I grew up! I think we depend on to much of the outside world anymore. We forget where we came from and I think in turn that makes us a less grateful nation. When I was a kid even it wasn't always I want at ever commercial or toy that was walked past. The I wants was; let's go to the creek, can you fill the barrel up with water so we can play, or I want to go catch critters on the glades. I think the experiance would be great for my kids. 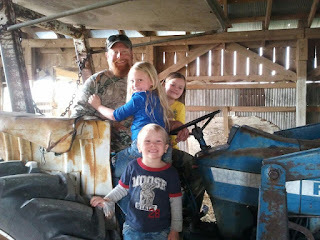 Once in awhile we go stay at "the farm house" for a night or two to visit family and my kids enjoy it. There is no TV, if they want entertained they go play outside or in the barn. The barn is fully set up with a rope swing, and last time we had even made a teeter totter out of a small bale of hay and a board. What are your ideas on a tiny house and living minimaly? Could you give up all the extra "stuff" in your home to move in something that would cost much less and leave a much smaller foot print on the enviroment?